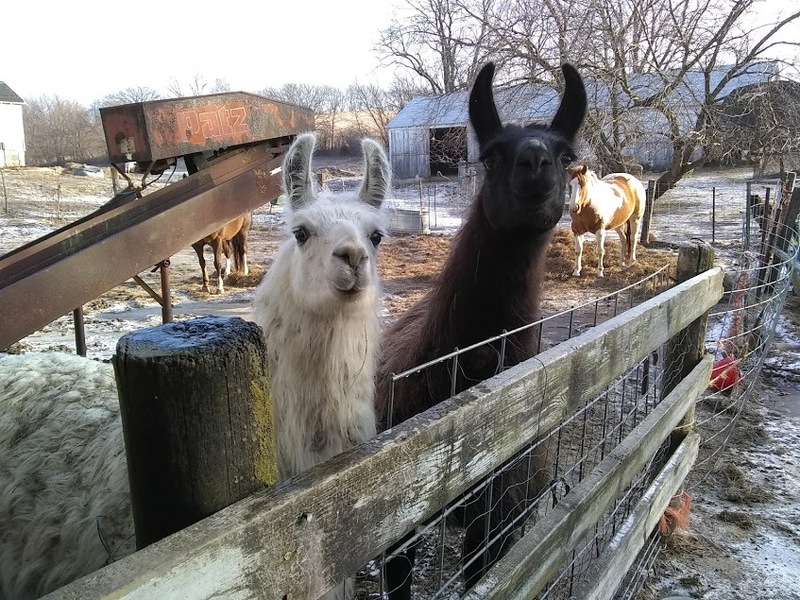 Our Dalai Llama on left with Bash on right! Another beautiful llama who came to live with us along with his buddy Bull- the Shire horse! Bash is 2 years old and grew up with Bull and a few other horses. He has no idea he is a llama- he thinks he is a horse! He loves Bull the most but does 'protect' the others too- Chelsea and Cricket. He is hilarious! His fleece is a beautiful black color that you don't see too often. There is very little guard hair in his fleece and what is present is also soft. I use his fleece in any project. It is gorgeous. Sinbad's fleece doesn't grow as long or thick as the other llamas so like Chaquita, we only shear him every other year. He gets the rest of the spa treatment on shearing day though! Bash is a very curious fellow, loves carrots and is VERY protective of his 'llamas' (horses). If they get upset about something he is immediately between them and the 'danger'. Oh Sinbad you silly horse, I mean llama! Bash was quite the naughty boy on shearing day. Good thing he's pretty right? ha! He was waiting his turn in a small paddock by the barn. The shearers were working in the front yard in the shade. We had two llamas out at a time. Once Bash saw what we were up to, he casually slipped out of a corner of the paddock? And just as casually sauntered away. Unshorn. Off to the 80 acre woods they browse in the summer. Wait what? Really Bash? It was like we would never see that big fellow leave? bwaahahahaha! Going to be a warm summer for him unfortunately. Silly llama. Bash's 'brother' is Bull- our giant Shire Horse. Bash grew up with Bull so has a bit of an identity crisis. He thinks he's a horse! Bull is a gentleman and loves Bash- even if he IS a llama! Bash was waiting for a shower- it's waaay too humid this summer!